The Seán Ó Faoláin Short Story Competition, hosted by the Munster Literature Centre and Southword Journal, is an annual short story competition open to writers from around the world, submissions accepted from May to July annually. It is dedicated to one of Ireland’s most accomplished story writers and theorists, sponsored by the Munster Literature Centre. If the winner comes to Cork to collect their prize, we will lavish them with hotel accommodation, meals, drinks and VIP access to the literary stars at the Cork International Short Story Festival (23 – 26 September 2015). The Munster Literature Centre is a not-for-profit organisation; all moneys raised from the competition benefits writers and writing. 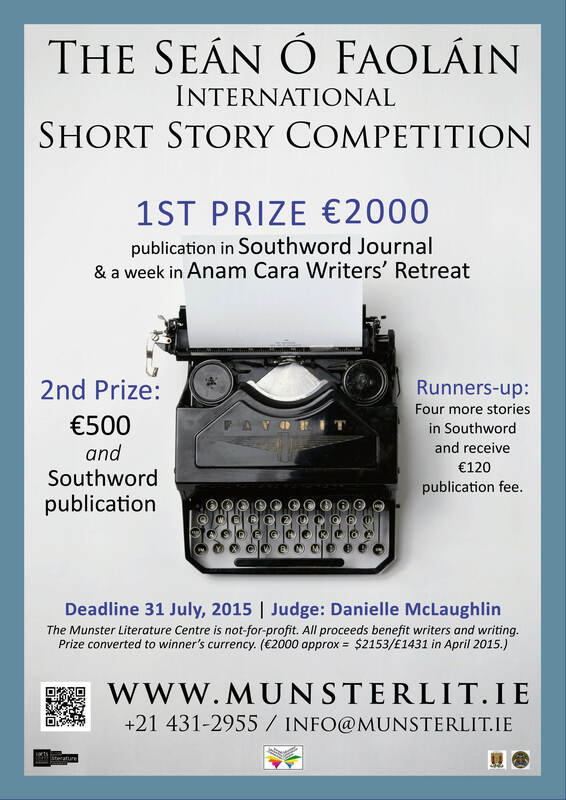 First Prize: €2,000*, publication in the literary journal Southword, AND a week-long residency at Anam Cara Writer’s and Artist’s Retreat. Danielle McLaughlin lives in County Cork. Her stories have appeared in The Stinging Fly, Southword, Long Story, Short, The Irish Times, Boyne Berries, Crannóg, The Burning Bush 2, Inktears, and Hollybough. They have also been published in various anthologies, most recently Willesden Herald New Short Stories 7 (2013), The Salt Anthology of New Writing 2013, Scraps – the NFFD Anthology 2013 and have been broadcast on RTE Radio. She has won a number of prizes for short fiction including the Writing Spirit Award for Fiction 2010, the From the Well Short Story Competition 2012, the William Trevor/Elizabeth Bowen International Short Story Competition 2012, The Willesden Herald Short Story Competition 2012 – 2013, the Merriman Short Story Competition in memory of Maeve Binchy, and the Dromineer Literary Festival Short Story Competition 2013. She was awarded an Arts Council Bursary in 2013. Her début collection is forthcoming from The Stinging Fly. Want to receive the results of the competition by email?